Fits comfortably in a backpack. Stands out on a retail shelf. 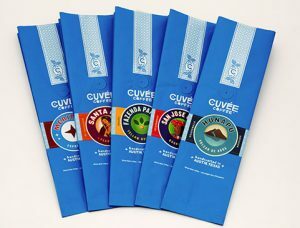 Convenient, durable, portable Flexible Packaging you can’t help but notice and absolutely love. These days, beautiful labels and specialty packaging define your brand. It’s the first thing your customer notices high up on a shelf. We create beautiful labels for your specialty packaging with the flexibility your customers love. These are high-quality labels, cost-effectively produced with the eye-catching designs brands depend on to stand out. Our digital labeling printing is perfect for products that need to be easy to store and carry for “on-the-go” lifestyles. It’s not just our packaging that’s flexible. It’s our entire system and potential for design. That is what is so critical to the success of the pouching of your products. One of the latest developments in labeling systems, flexible packaging can take literally hundreds of structure combinations, sealant layers, barrier foils and films. Our experienced line of product engineers will design the perfect labeling solution your customers will love. We thrive on collaboration. We’re in this together. Your success is also our own. People judge your product at a glance. It’s a subconscious decision guided by color and feeling. Clear blue feels happy, green grass refreshed, red eternally hungry. Specialty labels require flexibility and portability to fit an active lifestyle. Your labels need to be absolutely beautiful so your customers feel great about what’s inside. We’ll make your Flexible Packaging Labels absolutely beautiful and perfectly reliable. Contact us for a free consultation.